Last night I found out that one of my good friends (who just happens to be a talented musician) was going to be playing at the Pit Bar prior to the showing of Vienna Verona at BATS Theatre. "Why, that's just down the street from my house!" I thought. So, my plans of cooking an elaborate dinner flew out the window and E and I dashed down the road to the Pit. Given its proximity to my house (and Courtenay Place), I'm actually pretty surprised that I hadn't been there before. 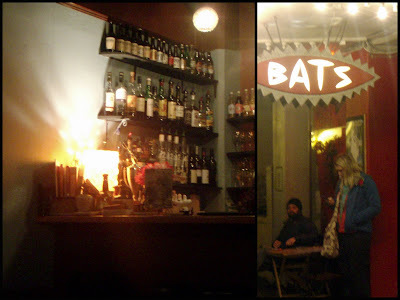 Housed inside the BATS theatre building, it's a cosy little space, perfect for a pre-show drink or two. 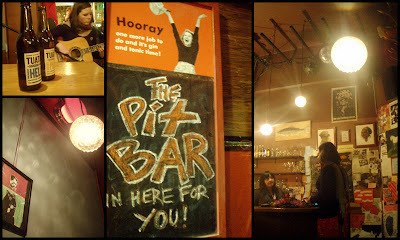 The Pit isn't much bigger than my living room, and it has an adorably sashed window (where H, aka Tiny Ruins played), charming wicker chairs and locally-made artwork hung on the walls. For such a small space, they have a surprising number of bands and musicians playing, as the many posters near the doorway suggest. I'd love to see more gigs there, as it's such an intimate venue. I didn't actually watch the play at BATS, though I may check it out later in the week(shortened versions of Shakespeare's Measure for Measure and Romeo and Juliet, put on by Three Spoon Theatre), so while the Pit was a hive of activity beforehand, during the show it was understandably empty. That said, the bar staff were amiable and engaged us in friendly banter as we sipped our drinks and ate a handful of sweets sneakily snatched from BATS' foyer. The Pit, while small, has decidedly good taste: their beer list includes the entire Tuatara range, as well as Emerson's and Mac's. If you're on a budget, their house wine is not to be missed at $6 (and of course there are more expensive varieties). And they seem to be pretty well-stocked in terms of spirits despite the tiny bar space. Hmm, perhaps I should make this place my local?